Yeah, another night of shooting in the deep dark recesses that is small concert venues. This one was well worth it, though. 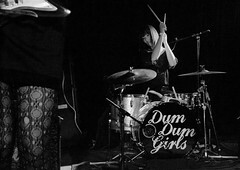 The Dum Dum Girl’s album “I will be” has been keeping me more than entertained since I was introduced to it late last year and seeing them in an intimate place like the Hi-Dive was great. I did have a little more help for the dark environment this time though. I recently added a 28 f/1.8 to my bag of tricks and it worked out wonderfully. The length is just right and the speed was very welcome in this challenging venue. The only thing that I didn’t like about them was the typical non-moving stage show that is so prevalent in today’s lo-fi, sub-pop, whatever-you-call-it scene. I much prefer an active stage, but at least the musical energy was up there. The image above is the only one I managed to get of anyone stepping away from a microphone. It happened a few more times but I didn’t get it. I shot this one without a writer handy so I had to do the writeup myself. Sometimes I wonder how I get away with writing like that… Most likely its because no money changes hands. Read the writeup and see the full set of photos at the Denver Post’s Reverb blog. 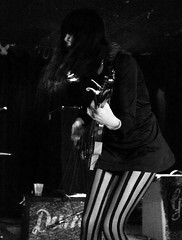 The second image also appears online in the Spectrum Culture review of the Dum Dum Girls in concert. Newer Operation "Shave the Wookiee" is under way.